Alexander Bradley, of Manchester, Conn., filed the Nov. 21 lawsuit against Turner Broadcasting System Inc. aka CNN, saying it “unreasonably” publicized his private life in its documentary film about Hernandez. Bradley says Hernandez shot him in the face on Feb. 13, 2013, in West Palm Beach, Fla. He was taken to Saint Mary’s Hospital, where he was treated for his injuries. In early 2015, CNN broadcast a film entitled “CNN Special Report: Downward Spiral – Inside the Case Against Aaron Hernandez.” In the film, which runs about 42 minutes long, images of the Bradley lying in a hospital bed appear continuously between segments around the 17- and 18-minute marks. Bradley says the images show him seemingly unconscious, bloodied, bandaged and intubated. The documentary aired several times on TV and has been continuously made available to the public on the internet. Bradley’s complaint says there have been more than 50,000 views on YouTube. “At no time mentioned herein did the plaintiff ever authorize anyone, including but not limited to St. Mary’s, CNN and/or any of their respective agents, employees or affiliates, to photograph him while lying in a hospital bed,” the complaint states. Bradley’s attorney argues that the photograph depicting his health condition is protected from disclosure by Florida Statute Sec. 456.057 and that there was no public purpose in airing the footage. 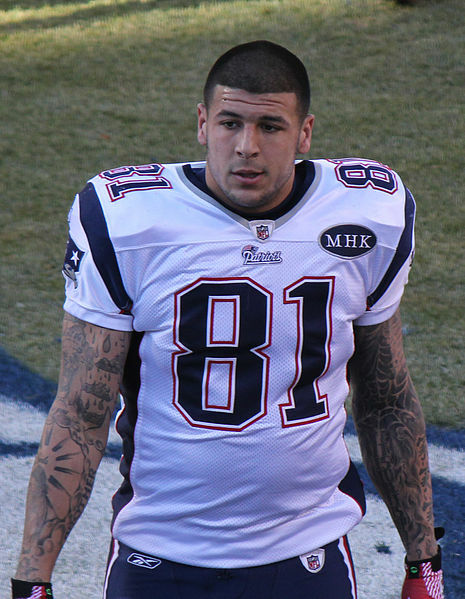 “While Aaron Hernandez’s life and criminal behavior may have been of legitimate public concern, the photograph of plaintiff itself in the condition he was in at the time was not,” according to the complaint. A CNN spokeswoman declined to comment on the lawsuit. Bradley is represented by Robert Berke and Jeffrey Cooper in Bridgeport, Conn.
Hernandez was a star tight end for the New England Patriots at the time of Bradley’s shooting. He was released from the team in June of that year when he was arrested for the murder of Odin Lloyd. Now serving life in prison for Lloyd’s murder, Hernandez settled a civil lawsuit by Bradley earlier this year. Hernandez also faces a trial for an unrelated 2012 double homicide.